Diabetic living – Cut the B.S.! … I mean Blood Sugar! Cut the B.S.! … I mean Blood Sugar! 10 Reasons Why it Rocks to Hang with a T1D Parent! 5 Years a Diabetic, Where Did The Time Go? 10 reasons why it rocks to hang out with a T1D parent! 1. They&apos;re so ready for a night out. Having the opportunity to let your hair down and have fun is rare for a parent of a T1D child…so when it does happen…ya wanna be around! 2. They know what you&apos;re doing at the happy hour table. No questions as to what we are doing and why there&apos;s blood on my finger. 3. They know how to carb count!!! Since they do all the carb counting for their child…they can do it for you too! Bolus me! 4. They&apos;re always in mom/dad mode. Adulting can be hard…adulting with T1D…can be even harder. Sometimes it&apos;s a relief to pass the torch on to someone who understands because I won&apos;t argue with them they way their T1D child might. Tell me what to do…it&apos;s cool! I&apos;m soooooo ok with that! 5. They always have a juice box ready! They also have glucose tabs and other random treats on them. They are always equipped in case of a low! 6. They probably volunteer and are members of the same community you are in. So those days when you can&apos;t go on…they&apos;re there to remind you to keep going…but not before we enjoy this happy hour! 7. They have a sense of humor about diabetes. Sometimes we have to and they have some of the best stories! I&apos;ll drink to that! 8. They don&apos;t judge…ever. I&apos;ve never heard, "Should you be eating that?" from a T1D parent. It could be because they have spent so much time helping their own T1D kid(s) live normal lives and bolusing for normal things that they don&apos;t blame us one bit for ordering that elephant ear! 9. We can be a resource for them. We can be here to be sounding boards. They can ask us if we were rebellious at their kid&apos;s age and why, or how they can be supportive of their child. They can ask us to describe what a low feels like and how we may need to be helped. It feels good to be able to give back to the people who take care of us. 10. They have the biggest hearts ever! Their hearts are overflowing with concern, advocacy, and love. They are true crusaders to our cause. Cheers to all the T1D Moms, Dads, Brothers, Sisters, and Friends out there! You inspire me and empower me to continue on this T1D journey. Until our next outing…line dancing perhaps? Donate to my JDRF One Walk Page by clicking here! I’m making these little tokens of appreciation for the crossing guards at my girls’ school. 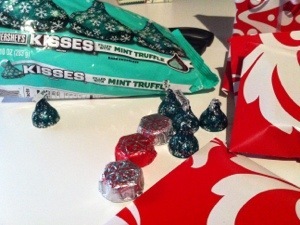 Since, I’m a sucker for chocolate mints I pop one of these dark chocolate filled with mint truffle Hershey’s kisses. At 2.78 grams of carbohydrates per kiss. I can still enjoy my holidays in my “cut the b.s.” manner.